This is the first book on influencing others aimed squarely at introverts, who make up half of the U.S. population. 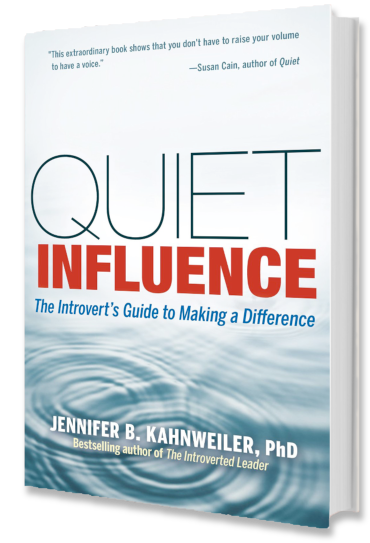 Jennifer Kahnweiler, bestselling author of The Introverted Leader, demonstrates precisely how introverts can be highly effective influencers and make a difference when, instead of trying to act like extroverts, they leverage six key strengths. 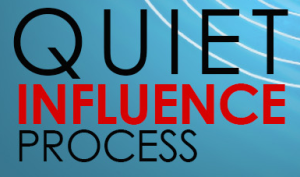 The book maps out a powerful process for raising your QIQ (Quiet Influence Quotient) and includes a comprehensive quiz and planning guides to track progress. Jennifer Kahnweiler shows millions of introverts how to harness the strengths they already have. It is the must-have guide to greater insight and impact that we’ve been waiting for. “Quiet Influence” is a great resource for introverts who want to learn how to use their strengths to maximize their effectiveness in the workplace. But wait―it’s also a wonderful handbook for extroverts who want to understand more about what makes their less-gregarious friends and colleagues tick. Jennifer Kahnweiler shows you how the masters of the art of quiet are able to get more done, be more creative, and sustain more energy than those who often live and work at a frantic, out-loud, always-on pace. The lessons in “Quiet Influence” will increase your capacity to have a profound effecton the actions and thoughts of others. This extraordinary book shows that you don’t have to raise your volume to have a voice.